A national financial news organization, IBD was one of the few polling organizations to predict a Trump victory, and it has accurately called the last four presidential elections. Caddell was chief pollster for liberal Democratic presidential candidates George McGovern in 1972, President Jimmy Carter in 1976 and 1980, former Sen. Gary Hart in 1984, then-Sen. Joe Biden in 1988 and California Gov. Jerry Brown in 1992. More recently, Caddell became a Fox News contributor. When polling the public, most mainstream firms “overloaded for Democrats, underloaded for Republicans and conservatives,” said Francis Coombs, managing editor of Rasmussen Reports. John Zogby, another independent pollster, also told TheDCNF he sees significant Democratic polling bias. “I am a liberal Democrat, but I always felt that other polls oversampled Democrats and undersampled Republicans,” he said. Zogby is the founder of the internationally acclaimed Zogby poll and a senior partner at John Zogby Strategies. 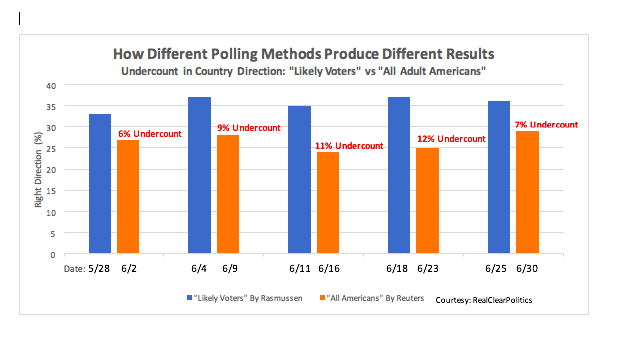 Since the 2016 elections, some polling companies have continued to survey “registered” or “likely voters,” a practice usually deployed near election time. These include pollsters at The Economist, Rasmussen, Fox News and USA Today. “If I were to start doing a poll of presidential approval, I personally would do registered voters,” said Kyle Kondik, managing editor of “Sabato’s Crystal Ball,” the web site for independent national pollster Larry Sabato of the University of Virginia. “If you’re looking specifically at trying to figure out the electoral effects, you’re probably better off doing registered voters or likely voters,” Kondik said. Kathleen Weldon, director of data operations at the Roper Center, which tracks policy-oriented polls, said pollsters should focus on measuring attitudes of people who care about issues. “If you speak with people who work on policy, you want to know about people who care about an issue. So, you can see very different attitudes between people who say that an issue is important and go to the polls and those who do not,” Weldon said. The polling industry called the election of Trump a “jarring event” in its official 2016 election report published by the American Association for Public Opinion Research (AAOPR), which is the industry’s trade association. But it recovered quickly, and its May 4, 2017, report by the AAOPR concluded national polling companies were not at fault in 2016. “National polls were generally correct and accurate by historical standards. National polls were among the most accurate in estimating the popular vote since 1936,” the AAOPR concluded. Shifting from “adults” to “likely voters” does appear to be a challenge for pollsters. “By and large, we’ve always reported presidential approval just based on adults 18 and above,” Dr. David Dutwin told TheDCNF. Dutwin is one of the industry’s top pollsters and serves as the executive vice president and chief methodologist at SSRS, the polling company the runs public opinion surveys for the joint CBS-New York Times reports. Dutwin is also vice president of the AAOPR. The differences between the two surveying strategies is vividly illustrated in polling numbers on Trump’s job approval ratings. Rasmussen, for example, since Jan. 20, 2017, has tracked Trump’s approval ratings between 42 to 57 percent, based on “likely voter” responses. By contrast, Gallup, polling “adults,” has reported Trump’s approval numbers hovering between 35 to 46 percent, a difference of as much as 11 percent. In the most current period from June 15 to July 5, those surveying all American adults found President Trump’s job approval ranged between 36 to 38 percent, according to Real Clear Politics (RCP). But those who polled “registered voters” or “likely voters” recorded Trump approval numbers between 41 to 44 percent. Mayur said he dismisses all presidential approval ratings because of the current toxic political environment. “I don’t even worry about the approval rating as much as many others do because it’s unfair with the incessant negative coverage that no other president has ever faced,” he said. Somewhat similar differences in outcomes are seen in charting attitudes for the “direction of the country,” according to RCP. Those who survey “likely” or “registered voters” approved of the country’s direction between 32 to 36 percent. Surveys of “adults” found only 29-31 percent believed the country was heading in the right direction. Also ignored by most polling companies is how Trump compares to former President Barack Obama. On July 28, 2016, only 22.9 percent of the public approved of the country’s direction, according to RCP. By July 2, 2017, that figure improved to 32 percent, a nine percent increase over Obama. Coombs said the liberal news media is largely out of step with the American public. Christopher Brooks contributed to this report.